Stretchtape’s low gauge, high-performance films are used in heavy packaging environments in which pallet wrapping speeds are critical for maintaining warehouse efficiency. These films can be dispensed with automated machinery and their excellent tear resistance and high stretch ration translate into less downtime. High-performance films are multilayered with different resin blends contributing to the strength profile of the film, making them ideal for loads that may have multiple puncture points. 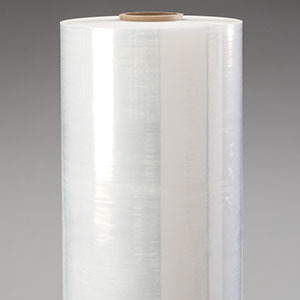 Our low gauge high-performance film can replace high-gauge films because of its high tensile strength and excellent puncture resistance that is necessary for heavy packaging operations. The film’s different resin profile makes it a strong, reinforced wrapping solution for pallets and packages of all shapes. High-performance film sticks to itself, not the product or package that it wraps around. Its high cling ability allows warehouse users to wrap, stack, and secure pallets without concern for product damage during transport or during film removal. 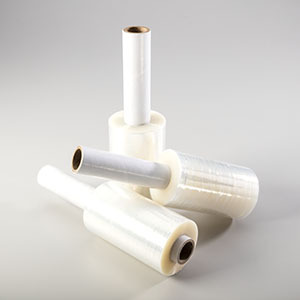 Stretch film has elastic memory and can stretch up to 250% of its original length. After wrapping, the film will tighten around items and secure the package. This packaging solution will not loosen during transport as may be the case with other packaging solutions. 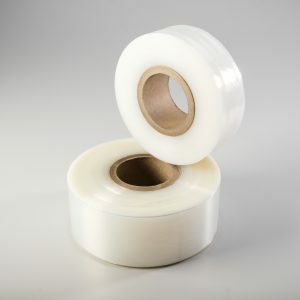 High-performance stretch film can also be customized to various widths, sizes, and can be designed with specialized properties. 10" 80 EQ Various 3"
10" 90 EQ Various 3"
10" 120 EQ Various 3"
12" 80 EQ Various 3"
12" 90 EQ Various 3"
12" 120 EQ Various 3"
20" 90 EQ Various 3"
20" 120 EQ Various 3"
Custom sizes and gauges may be available upon request.